We've seen that the primary advantages of the corporate form of organization are that ownership can be transferred more quickly and easily than with other forms and that money can be raised more readily. Both of these advantages are significantly enhanced by the existence of financial markets, and financial markets play an extremely important role in corporate finance. The interplay between the corporation and the financial markets is illustrated in Figure 1.2. The arrows in Figure 1.2 trace the passage of cash from the financial markets to the firm and from the firm back to the financial markets. Suppose we start with the firm selling shares of stock and borrowing money to raise cash. 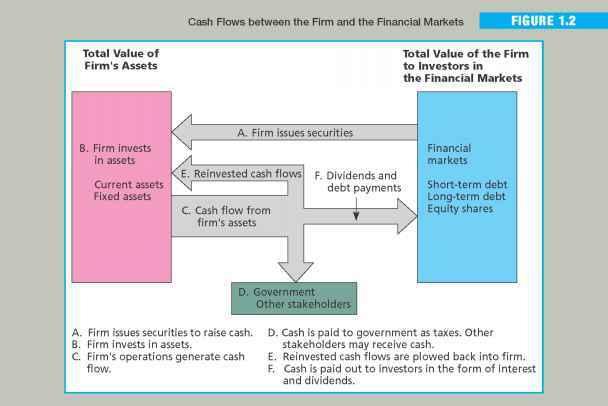 Cash flows to the firm from the financial markets (A). The firm invests the cash in current and fixed assets (B). These assets generate some cash (C), some of which goes to pay corporate taxes (D). After taxes are paid, some of this cash flow is reinvested in the firm (E). 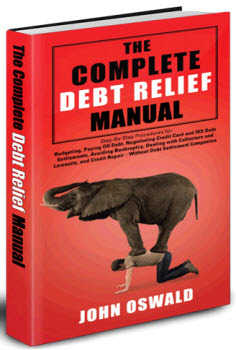 The rest goes back to the financial markets as cash paid to creditors and shareholders (F). A financial market, like any market, is just a way of bringing buyers and sellers together. In financial markets, it is debt and equity securities that are bought and sold. Financial markets differ in detail, however. 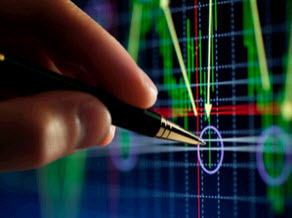 The most important differences concern the types of securities that are traded, how trading is conducted, and who the buyers and sellers are. Some of these differences are discussed next. Financial markets function as both primary and secondary markets for debt and equity securities. The term primary market refers to the original sale of securities by governments and corporations. The secondary markets are those in which these securities are bought and sold after the original sale. Equities are, of course, issued solely by corporations. Debt securities are issued by both governments and corporations. In the discussion that follows, we focus on corporate securities only. Primary Markets In a primary market transaction, the corporation is the seller, and the transaction raises money for the corporation. Corporations engage in two types of primary market transactions: public offerings and private placements. A public offering, as the name suggests, involves selling securities to the general public, whereas a private placement is a negotiated sale involving a specific buyer. By law, public offerings of debt and equity must be registered with the Securities and To learn more about the Exchange Commission (SEC). Registration requires the firm to disclose a great deal of SEC, visit www.sec.qov. information before selling any securities. The accounting, legal, and selling costs of T public offerings can be considerable. Partly to avoid the various regulatory requirements and the expense of public offerings, debt and equity are often sold privately to large financial institutions such as life insurance companies or mutual funds. Such private placements do not have to be registered with the SEC and do not require the involvement of underwriters (investment banks that specialize in selling securities to the public). Secondary Markets A secondary market transaction involves one owner or creditor selling to another. It is therefore the secondary markets that provide the means for transferring ownership of corporate securities. Although a corporation is only directly involved in a primary market transaction (when it sells securities to raise cash), the secondary markets are still critical to large corporations. The reason is that investors are much more willing to purchase securities in a primary market transaction when they know that those securities can later be resold if desired. Dealer versus Auction Markets There are two kinds of secondary markets: auction markets and dealer markets. Generally speaking, dealers buy and sell for themselves, at their own risk. A car dealer, for example, buys and sells automobiles. In contrast, brokers and agents match buyers and sellers, but they do not actually own the commodity that is bought or sold. A real estate agent, for example, does not normally buy and sell houses. Dealer markets in stocks and long-term debt are called over-the-counter (OTC) markets. Most trading in debt securities takes place over the counter. The expression over the counter refers to days of old when securities were literally bought and sold at counters in offices around the country. Today, a significant fraction of the market for stocks and almost all of the market for long-term debt have no central location; the many dealers are connected electronically. Auction markets differ from dealer markets in two ways. First, an auction market or exchange has a physical location (like Wall Street). Second, in a dealer market, most of the buying and selling is done by the dealer. The primary purpose of an auction market, on the other hand, is to match those who wish to sell with those who wish to buy. Dealers play a limited role. Trading in Corporate Securities The equity shares of most of the large firms in the United States trade in organized auction markets. The largest such market is the New York Stock Exchange (NYSE), which accounts for more than 85 percent of all the shares traded in auction markets. Other auction exchanges include the American Stock Exchange (AMEX) and regional exchanges such as the Pacific Stock Exchange. In addition to the stock exchanges, there is a large OTC market for stocks. In 1971, the National Association of Securities Dealers (NASD) made available to dealers and brokers an electronic quotation system called NASDAQ (NASD Automated Quotation system, pronounced "naz-dak" and now spelled "Nasdaq"). There are roughly two times as many companies on Nasdaq as there are on NYSE, but they tend to be much smaller in size and trade less actively. There are exceptions, of course. Both Microsoft and Intel trade OTC, for example. Nonetheless, the total value of Nasdaq stocks is much less than the total value of NYSE stocks. There are many large and important financial markets outside the United States, of course, and U.S. corporations are increasingly looking to these markets to raise cash. The Tokyo Stock Exchange and the London Stock Exchange (TSE and LSE, respectively) are two well-known examples. The fact that OTC markets have no physical location means that national borders do not present a great barrier, and there is now a huge international OTC debt market. Because of globalization, financial markets have reached the point where trading in many investments never stops; it just travels around the world. To learn more about the exchanges, visit www.nyse.com and www.nasdaq.com.. Listing Stocks that trade on an organized exchange are said to be listed on that exchange. In order to be listed, firms must meet certain minimum criteria concerning, for example, asset size and number of shareholders. These criteria differ from one exchange to another. NYSE has the most stringent requirements of the exchanges in the United States. For example, to be listed on NYSE, a company is expected to have a market value for its publicly held shares of at least $100 million and a total of at least 2,000 shareholders with at least 100 shares each. There are additional minimums on earnings, assets, and number of shares outstanding.